Implementation of innovation can be a slow process and some people just can’t wait for the future to happen. If you are impatient in terms of seeing great things turned into practice, you are on the same line with the Nordic Center for Sustainable Healthcare that is working on Grønnköpingkið project. 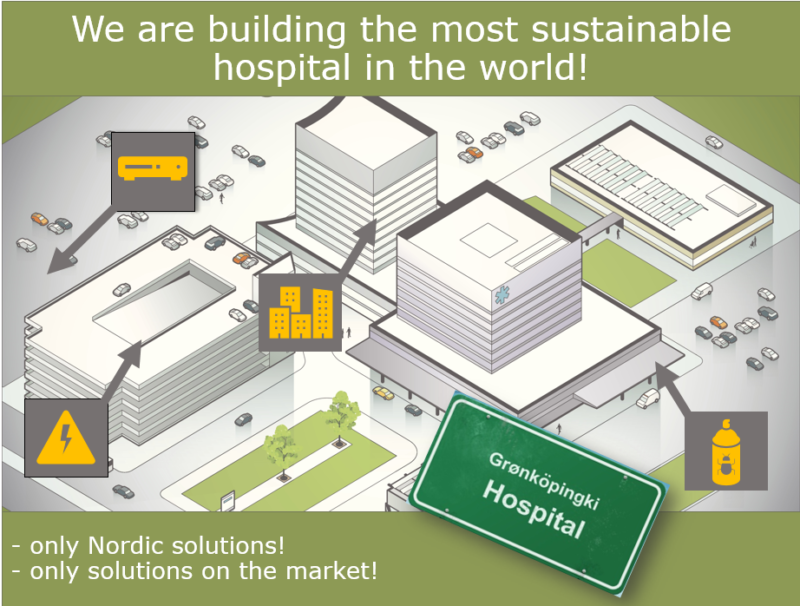 They came up with the fictive Nordic city Grønnköpingkið with the aim to build the most sustainable hospital in the World equipped with the best solutions Nordics can offer. The result will be an interactive model where you can find solutions within various categories such as energy efficiency, waste management, Pharma, Transportation and logistics, Medtech and medical devices, ICT – solutions, water treatment, Interior design, etc. If you got interested in the Grønnköpingkið project and want to have your solution being a part of it, check out for more instructions. Grønnköpingkið is also a project of Nordic friendship supporting the Nordic collaboration and building bridges between the Nordic countries. For the non-Nordic solutions, there will be an international arena with the solutions that simply are too good not to include. Sustainable Healthcare is focused on delivering high quality care without exhausting natural resources or causing severe ecological damage and ensuring that available resources (physical, financial and human) are used efficiently and responsibly. Sustainable Healthcare is cross-sectoral and not assigned to a specific industry. Nordic Center for Sustainable Healthcare (NCSH) is a cross-sectoral arena for stakeholders, organizations, projects and expert knowledge in the area of sustainable healthcare. NCSH is an umbrella organization for companies, hospitals, regions, universities, projects and competence. NCSH brought a session to this year’s Upgraded Life Festival about Sustainable Healthcare and why it matters. Over the past 10 years, interest in Sustainable Healthcare has grown globally. The Nordics are considered one of the world leaders in this area. However, the area of sustainable healthcare has not yet lived up to its full export potential. Together with NCSH, we’re joining the Nordic delegation to Tel Aviv (14-15.11) to increase business, knowledge and collaborations within sustainable healthcare solutions and smart, circular cities. All organisation interested in Israeli market, are welcome to join.